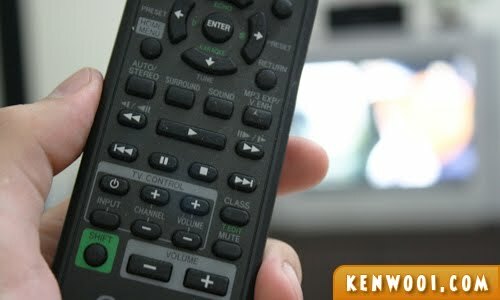 Whenever I’m not staring on the computer screen to surf the Internet, the next screen I’d be staring at has to be the television. In fact, it’s quite fun to be a couch potato sometimes. I always enjoy watching documentaries on how things are made, aliens and fascinating stories. Well, sports as well on the weekend. The current one is pretty… outdated. Yes, ladies and gentlemen, that’s a CRT TV. Despite that, I consider myself fortunate since I’m still able to watch my favourite channels. 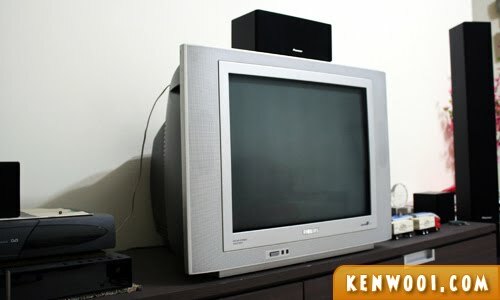 But with the rapid advancement of technology lately, I realize that in order to keep in touch with the latest trendy community, I have to get my hands on a BIGGER and BETTER TV. 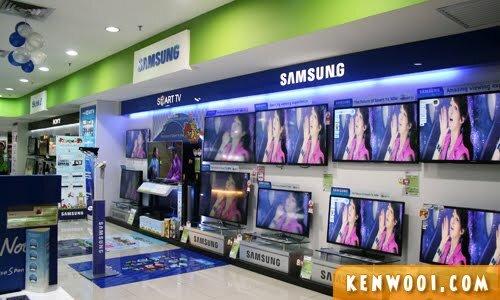 With so many electrical appliances under one roof, I’m very sure that I’ll find my next TV here. 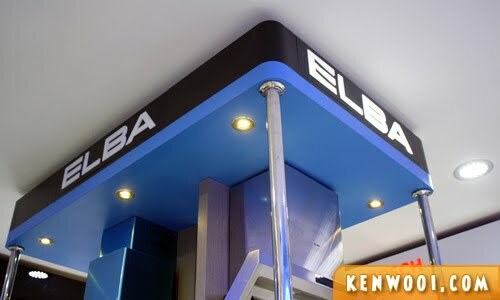 It’s really exciting to see various appliances from various brands at various sections within the outlet. It felt like “Toys R Us” in there – only that it’s for the adults instead. 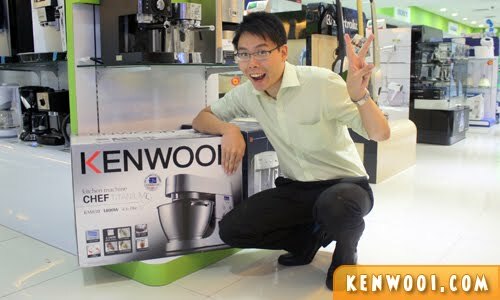 KENWOOI – It makes me proud! Anyway, after walking around for quite a bit, I finally spotted the TV section! Woah, they have a massive collection of TVs! 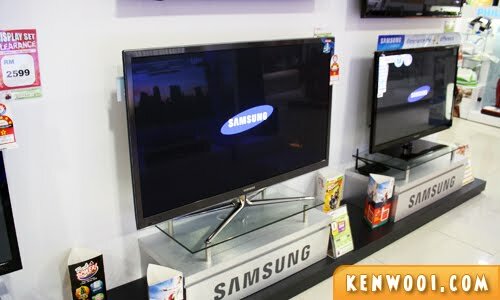 Smart TV, Internet TV, 3D TV – ask any type of TV and I’m sure they’ll usher you to your desired TV model. Know what, I fell in love with it almost instantly. This TV is super big, super clear and super attractive! I can’t help but to spend some quality time with it, before deciding to make a purchase. 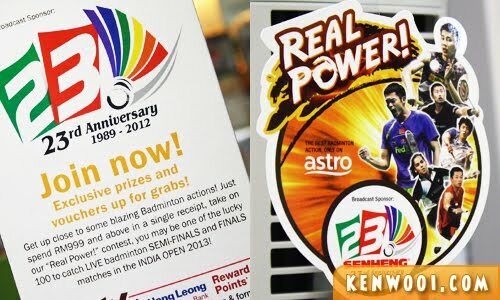 Oh by the way, in-conjunction with Senheng’s 23rd Anniversary Real Power, they’re organizing a contest to send 100 badminton fans to India Open 2013 to watch badminton matches live! At senQ, you gotta take a creative photo with the paper board badminton players and stand a chance to be one of the lucky winners to win a Samsung Galaxy Tab 2! Check out https://apps.facebook.com/senq_snapnwin to find out more. Also, there are many reasons to buy from senQ. 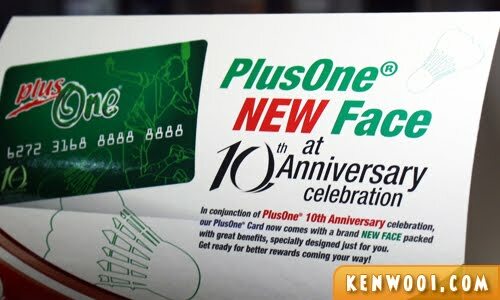 Plus One members can have additional 1 year warranty with just RM12. With V-Care, members can also choose to extend extra years of warranty. Not forgetting their one-to-one replacement for small appliances if they’re spoiled within 2 years. I can’t stop admiring the beautiful creation of plasma. 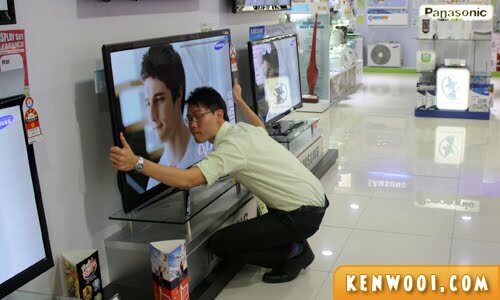 Oh yeah, I dare admit that I’m in love with the TV, and I don’t feel gay at all. Seriously, I don’t even feel gay even though there’s a cute dude on the screen while I was hugging it. HAHAHAHA! I can’t believe you got a promoter to “drag” you away from your beloved TV! Does he not know that you’re a potential customer? ken.. can I watch movie with you.. :D..
A contest eh? Good luck!!! 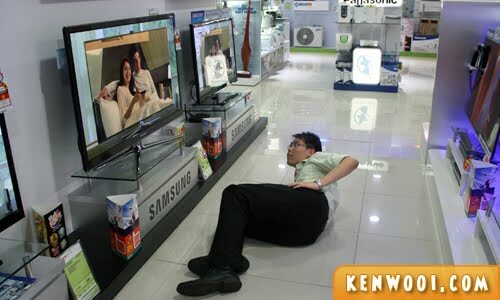 Hope you will get your new TV!!! How much for that TV. 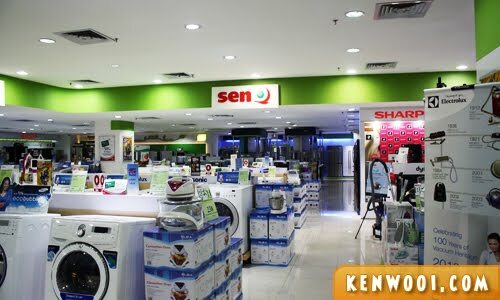 51″ must be darnnnnn expensive.. Oh btw, there’s a first branch of SenQ in Kuching located in Bourlevard Hypermall New Wing. Checked out and it’s really like the “Toys’R’Us” for adults. mama always tell us that don’t watch TV too near! Phew you are so determined even the strongest deter-gent cant even get you away from your love. 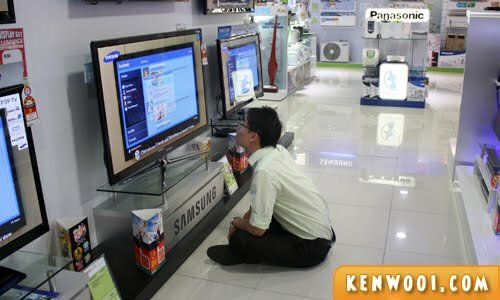 Beg borrow or steal, by hook or by Samseng grab Samsung home. 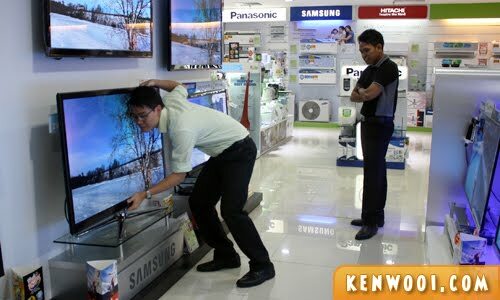 hard to guard ken when his near that tv.. aiyaaa.. hahaha.. Plasma TV? It’s outdated! 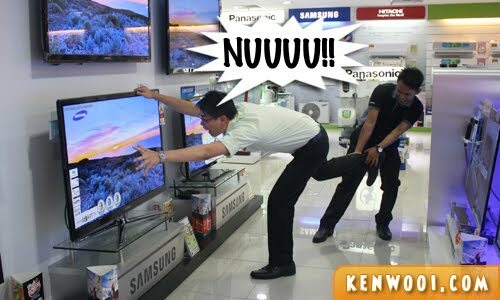 Go get LED TV!! : ) Wah get promoter to help you in the act? LOL!